Cold Brew Coffee… and Tea? A few years ago, we discovered the deliciousness of cold brew coffee. It’s surprisingly simple to make, tends to be less bitter than drip coffee, and takes up far less of our precious counter space. 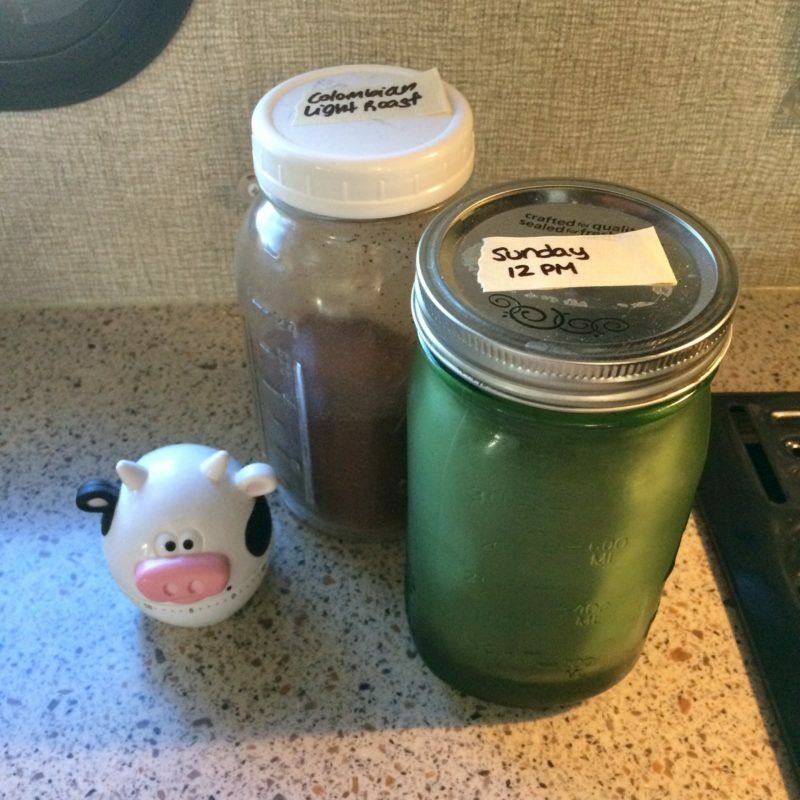 Before we committed to buying gadgets specifically for cold brewing coffee, we tried it the low-tech way: adding 1/8 cup to 1/4 cup coarsely ground beans to a one-quart mason jar with filtered water, and letting it steep in the fridge for 8-24 hours. We filtered it using a standard coffee filter or cheese cloth, which took a little while, and could be messy, but it did the job. So we upped our game by buying the right tool for the job: a mason jar infuser for cold brew coffee. After steeping for 8-24 hours (depending on laziness and caffeine needs), we remove the filter and start a new jar, so at any given time, we have a jar brewing and a jar brewed and ready for drinking. We usually like our coffee cold, but if we want something hot, we warm it up on the stove or in the microwave. Having cold brew on hand takes a little planning, but it’s worth it. And cold brewed coffee can stay delicious in the fridge for a week or two, unlike the sad sludge that happens in a drip coffee maker that’s been left out for a few hours. Tea can be cold brewed, too! Add 3 or 4 tea bags to a one-quart jar of water, and steep in the fridge for 8-24 hours. It does not brew as strong, but it’s rarely bitter, and it makes a great iced tea. We especially love to do this with spiced chai, and adding Califia Farms vanilla almond milk creamer after brewing. And yes, we do buy our creamer in those quart-sized 6 packs! We love it so much and hate the thought of traveling where it might not be available, so it’s well worth the space in our pantry. Coffee and tea are available almost anywhere, but traveling with food allergies can be tough if you like cream in your coffee. Gluten-Free RV is a participant in the Amazon Services LLC Associates Program, and some links in this post are affiliate links. This means that there will be no additional cost to you if you shop at Amazon.com using these links, but we will receive a small percentage of those purchases as a commission. Your purchases are confidential: we will never know what you buy or if you buy anything.